As in Module 4, you are going to assess how well your institution and/or partnership is doing, or is prepared to do, in specific focus areas of career pathways. In this module, you'll assess your work around the topics of Funding, Policy and Program Alignment, Evaluation, and Communication. After you consider what's working and what needs improvement, use the provided questions in the activity sheets to discuss opportunities, challenges, and action items with your group. You'll use your responses to help prioritize tasks for the Action Plan explained below. 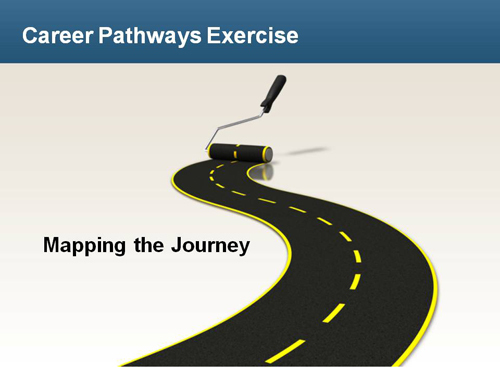 Using the Career Pathways Action Plan template, reference the opportunities, challenges, and action items discussed with your group in the preceding modules to identify your action items, responsible parties, timeframe, and outcomes for each major career pathways focus area. Circulate among your working group, partnership committee, or staff team to ensure buy-in from all parties responsible for action items. Discuss the timeframe for each action item and make adjustments as needed, then begin implementing your plan. Refer to the plan on a regular basis (weekly, monthly) to ensure all action items are on track for completion by their identified due date. Feel free to add or delete focus areas from the template depending on your group's areas of responsibility or existing elements in place.